A team led by Heather Young and John Furness has demonstrated a possible cell therapy to treat gastrointestinal motility disorders like Hirschsprung disease. 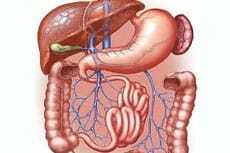 For patients with these diseases, the nerves that signal the digestive system to contract are not present, and surgery is required to correct this deficit. As reported in The Journal of Clinical Investigation, the transplantation of neural progenitor from mouse embryos can migrate and proliferate to the nerve-less gut in a mouse model.